I have been keeping tarantulas since I was in Std. 4. I'm now in my 30's, and my enthusiasm burns as brightly as it did before. Back then it was legal to keep Baboon Spiders and illegal to keep tarantulas. South African nature conservation laws have since made it illegal to keep Baboon Spiders in South Africa without a permit. 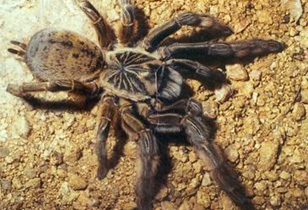 It isn't clear whether keeping tarantulas is illegal in South Africa or not. 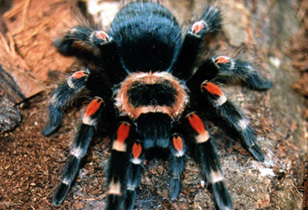 Many pet shops are selling tarantulas, and so many private people are breeding them that the point is perhaps moot. The numbers are just too big to police. Having said that, tarantulas have brought me much joy over the years. Many species of tarantula make for easy pets to keep, and even the more tricky ones are not that difficult to maintain if you stick to the basics. This website is designed to educate and encourage the beginner to get into the field of Arachnology. I have used the tarantula as a genus indicative of keeping and breeding spiders in general for a number of reasons. With at least 43,678 spider species and 109 families of spider recorded by taxonomists worldwide, it is simply too exhaustive to categorise the upkeep and maintenance of them all. Besides, who wants to keep a common brown house spider? Tarantulas are exotic, wonderful creatures that have always inspired awe in the minds of the public, so it is with an awareness of this vision of mystery and intrigue that I present to you the details that I have gleaned through my personal experience with some of the most beautiful creatures to grace the earth. I hope you find this website informative and useful.